The House of Plantagenet was a royal house which originated from the lands of Anjou in France. The name Plantagenet is used by modern historians to identify four distinct royal houses: the Angevins, who were also counts of Anjou; the main body of the Plantagenets following the loss of Anjou; and the Plantagenets' two cadet branches, the houses of Lancaster and York. The family held the English throne from 1154, with the accession of Henry II, until 1485, when Richard III died in battle. The Kingdom of England was a sovereign state on the island of Great Britain from 927, when it emerged from various Anglo-Saxon kingdoms until 1707, when it united with Scotland to form the Kingdom of Great Britain. Normandy is one of the 18 regions of France, roughly referring to the historical Duchy of Normandy. Anjou is a historical province of France straddling the lower Loire River. Its capital was Angers and it was roughly coextensive with the diocese of Angers. It bordered Brittany to the west, Maine to the north, Touraine to the east and Poitou to the south. The adjectival form of Anjou is Angevin, and inhabitants of Anjou are known as Angevins. During the Middle Ages, the County of Anjou, ruled by the Counts of Anjou, was a prominent fief of the French crown. The Salic law, or the Salian law, was the ancient Salian Frankish civil law code compiled around AD 500 by the first Frankish King, Clovis. The written text is in Latin, or in "semi-French Latin" according to some linguists; it also contains what Dutch linguists describe as one of the earliest known records of Old Dutch, perhaps second only to the Bergakker inscription. It remained the basis of Frankish law throughout the early Medieval period, and influenced future European legal systems. The best-known tenet of the old law is the principle of exclusion of women from inheritance of thrones, fiefs and other property. The Salic laws were arbitrated by a committee appointed and empowered by the King of the Franks. Dozens of manuscripts dating from the 6th to 8th centuries and three emendations as late as the 9th century have survived. Charles IV, called the Fair in France and the Bald in Navarre, was the fifteenth and last king of the direct line of the House of Capet, King of France and King of Navarre from 1322 to his death. Charles was the third son of Philip IV; like his father, he was known as "the fair" or "the handsome". Proximity of blood, or proximity by degree of kinship, is one of the ways to determine hereditary succession based on genealogy. In effect, the application of this rule is a refusal to recognize the right of representation, a component of primogeniture. 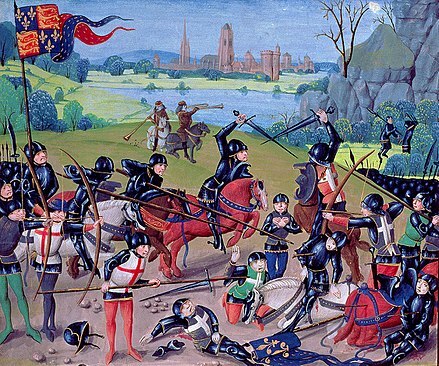 The Battle of Agincourt was one of the greatest English victories in the Hundred Years' War. It took place on 25 October 1415 near Azincourt in the County of Saint-Pol, in northern France. England's unexpected victory against a numerically superior French army boosted English morale and prestige, crippled France, and started a new period in the war during which the English began enjoying great military successes. A ceasefire, also called cease fire, is a temporary stoppage of a war in which each side agrees with the other to suspend aggressive actions. Ceasefires may be declared as part of a formal treaty, but they have also been called as part of an informal understanding between opposing forces. A ceasefire is usually more limited than a broader armistice, which is a formal agreement to end fighting. 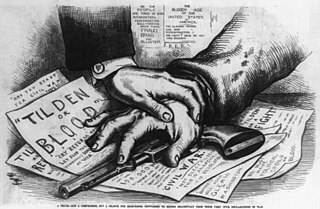 Successful ceasefires may be followed by armistices, and finally by peace treaties. 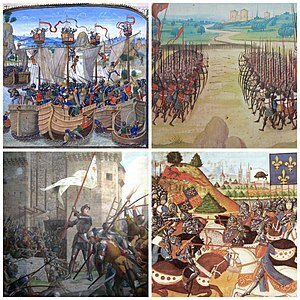 The Edwardian War was the first phase of the Hundred Years' War between France and England. It was named after King Edward III of England, who claimed the French throne in defiance of King Philip VI of France. 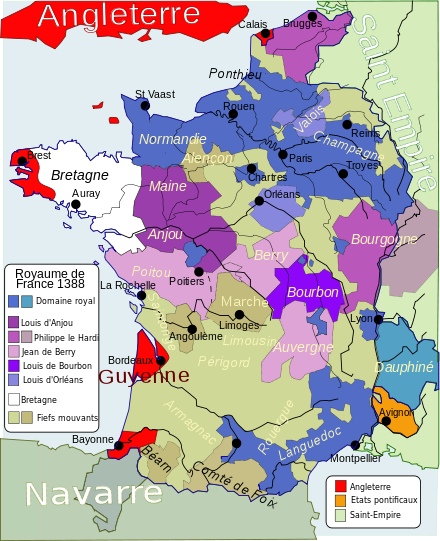 The dynastic conflict was caused by disputes over the French feudal sovereignty over Aquitaine and the English claims over the French royal title. The Kingdom of England and its allies dominated this phase of the war. The Caroline War was the second phase of the Hundred Years' War between France and England, following the Edwardian War. It was so-named after Charles V of France, who resumed the war nine years after the Treaty of Brétigny. The Kingdom of France dominated this phase of the war. A war of succession or succession war is a war prompted by a succession crisis in which two or more individuals claim the right of successor to a deceased or deposed monarch. The rivals are typically supported by factions within the royal court. Foreign powers sometimes intervene, allying themselves with a faction. This may widen the war into one between those powers. French nationalism promotes the cultural unity of France. Nationalism is a political, social, and economic ideology and movement characterized by the promotion of the interests of a particular nation, especially with the aim of gaining and maintaining the nation's sovereignty (self-governance) over its homeland. Nationalism holds that each nation should govern itself, free from outside interference (self-determination), that a nation is a natural and ideal basis for a polity, and that the nation is the only rightful source of political power. It further aims to build and maintain a single national identity—based on shared social characteristics such as culture, language, religion, politics, and belief in a shared singular history—and to promote national unity or solidarity. Nationalism, therefore, seeks to preserve and foster a nation's traditional culture, and cultural revivals have been associated with nationalist movements. It also encourages pride in national achievements, and is closely linked to patriotism. Nationalism is often combined with other ideologies, such as conservatism or socialism for example. With the Black Prince gone from Castile, Henry de Trastámara led a second invasion that ended with Peter's death at the Battle of Montiel in March 1369. The new Castilian regime provided naval support to French campaigns against Aquitaine and England. In 1372 the Castilian fleet defeated the English fleet in the Battle of La Rochelle. ↑ 24 May 1337 is the day when Philip VI of France confiscated Aquitaine from Edward III of England, who responded by claiming the French throne. 19 October 1453 is when Bordeaux fell to the French; there were no more hostilities afterwards. ↑ During the War of the Breton Succession (1341–1365), the House of Blois supported the French. ↑ Fought against England during Despenser's Crusade. ↑ In accordance with the Treaty of Troyes, Henry VI of England became disputed king of France in 1422, and reigned as Henry II in the areas of France which were loyal to him. ↑ During the Lancastrian War (1415–53), Burgundy recognised the King of England as King of France, and became a key English ally. ↑ Throughout much of the war, Brittany maintained either a careful neutrality or switched sides according to convenience. During the War of the Breton Succession (1341–1365), the House of Montfort backed the English. 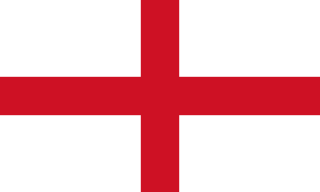 ↑ Due to the economic ties between Flanders and England, the Flemish backed the English several times in the war, mainly during the Edwardian War and in parts of the Lancastrian War (when the county was in a personal union with the Duchy of Burgundy, an English ally). Flemish vassal ties to the House of Valois also at times brought them into conflict with England, such as at Cadzand, during the Caroline War, and during Despenser's Crusade. ↑ Fought with England during Despenser's Crusade. 1 2 Brissaud 1915, pp. 329–330. ↑ Previté-Orton 1978, p. 872. ↑ Bartlett 2000, p. 22. ↑ Bartlett 2000, p. 17. ↑ Harris 1994, p. 8. 1 2 Prestwich 1988, p. 298. ↑ Prestwich 2007, pp. 292–293. ↑ Wilson 2011, p. 194. ↑ Prestwich 2007, p. 394. 1 2 Prestwich 2007, p. 306. ↑ Prestwich 2007, pp. 304–305. ↑ Sumption 1999, p. 180. ↑ Sumption 1999, p. 184. ↑ Prestwich 2003, pp. 149–150. 1 2 Prestwich 2007, pp. 307–312. 1 2 Friar 2004, pp. 480–481. ↑ Sumption 1999, pp. 188–189. ↑ Sumption 1999, pp. 233–234. 1 2 3 Rogers 2010, pp. 88–89. ↑ Auray, France. Encyclopedia Britannica. Archived from the original on 15 April 2018. Retrieved 14 April 2018. 1 2 Prestwich 2007, pp. 318–319. ↑ Rogers 2010, pp. 55–45. ↑ Grummitt 2008, p. 1. ↑ The Black Death, transl. & ed. Rosemay Horrox, (Manchester University Press, 1994), 9. ↑ Lee 1903, p. 388. 1 2 Le Patourel 1984, pp. 20–21. ↑ Wilson 2011, p. 218. 1 2 3 4 Guignebert 1930, Volume 1. pp. 304–307. ↑ Venette 1953, p. 66. 1 2 Prestwich 2007, p. 326. ↑ Le Patourel 1984, p. 189. ↑ "Apr 13, 1360: Hail kills English troops". History.com . Archived from the original on 5 September 2012. Retrieved 22 January 2016. ↑ Le Patourel 1984, p. 32. 1 2 Chisholm 1911, p. 501. ↑ Wagner 2006, pp. 102–103. ↑ Ormrod 2001, p. 384. ↑ Backman 2003 , pp. 179–180 – Nobles captured in battle were held in "Honorable Captivity", which recognised their status as prisoners of war and permitted ransom. ↑ Wagner 2006, pp. 86. ↑ Curry 2002, pp. 69–70. 1 2 Wagner 2006, p. 78. 1 2 Wagner 2006, p. 122. ↑ Wagner 2006, pp. 3–4. ↑ The Safeguard of the Sea: A Naval History of Britain 660–1649. Penguin UK. 2004. p. 52. ↑ Medieval Culture and the Mexican American Borderlands. Texas A&M University Press. 2001. p. 186. ↑ Sumption 2012, pp. 187–196. 1 2 3 4 5 Tuck 2004. ↑ Sumption 2012, pp. 385–390, 396–399. ↑ Sumption 2012, p. 409. ↑ Sumption 2012, p. 411. 1 2 Baker 2000, p. 6. 1 2 Neillands 2001, pp. 182–184. 1 2 Curry 2002, pp. 77–82. ↑ Mortimer 2008, pp. 253–254. ↑ Mortimer 2008, pp. 263–264. ↑ Agincourt: Myth and Reality 1915–2015. p. 70. 1 2 3 4 5 6 7 Allmand 2010. 1 2 Turchin 2003, pp. 179–180. ↑ Wagner 2006, pp. 44–45. 1 2 3 4 5 Griffiths 2015. ↑ Wagner 2006, pp. 307–308. 1 2 3 Davis 2003, pp. 76–80. 1 2 "Sir John Fastolf (MC 2833/1)". Norwich: Norfolk Record Office. Archived from the original on 23 September 2015. Retrieved 20 December 2012. ↑ Jaques 2007, p. 777. 1 2 3 4 Lee 1998, pp. 145–147. ↑ Sumption 1999, p. 562. ↑ Nicolle 2012, pp. 26–35. 1 2 Wagner 2006, p. 79. 1 2 "Every version of the complaints put forward by the rebels in 1450 harps on the losses in France" ( Webster 1998 , pp. 39–40). ↑ Neillands 2001, pp. 290–291. ↑ Janvrin & Rawlinson 2016, p. 15. ↑ Janvrin & Rawlinson 2016, p. 16. ↑ Holmes Jr. & Schutz 1948, p. 61. ↑ Ladurie 1987, p. 32. ↑ Neillands 2001, pp. 110–111. ↑ Powicke 1962, p. 189. ↑ Jones 2008, pp. 1–17. Gascony is an area of southwest France that was part of the "Province of Guyenne and Gascony" prior to the French Revolution. The region is vaguely defined, and the distinction between Guyenne and Gascony is unclear; by some they are seen to overlap, while others consider Gascony a part of Guyenne. Most definitions put Gascony east and south of Bordeaux. Philip VI, called the Fortunate and of Valois, was the first King of France from the House of Valois. He reigned from 1328 until his death. The Duke of Aquitaine was the ruler of the ancient region of Aquitaine under the supremacy of Frankish, English, and later French kings. 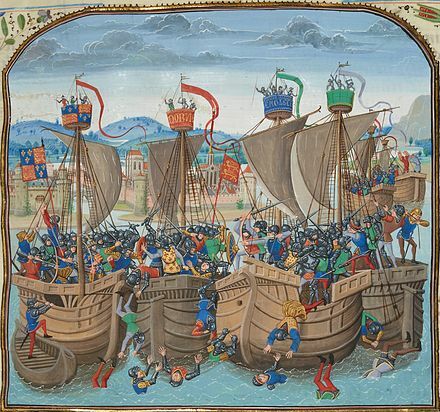 The Battle of Sluys, also called the Battle of l'Ecluse, was a naval battle fought on 24 June 1340 between England and France, in the roadstead of the port of Sluis, on a since silted up inlet between Zeeland and West Flanders. The English fleet of 120–150 ships was led by Edward III of England and the French of 230 by the Breton knight Hugues Quiéret, Admiral of France, and Nicolas Béhuchet, Constable of France. It was one of the opening engagements of the Hundred Years' War. The Duchy of Aquitaine was a historical fiefdom in western, central and southern areas of present-day France to the south of the Loire River, although its extent, as well as its name, fluctuated greatly over the centuries, at times comprising much of what is now southwestern France (Gascony) and central France. The Battle of Winchelsea or the Battle of Les Espagnols sur Mer, was a naval battle that took place on 29 August 1350 and was a victory for an English fleet of 50 ships commanded by King Edward III over a Castilian fleet of 47 larger vessels commanded by Charles de La Cerda. Between 14 and 26 Castilian ships were captured, and several were sunk. Only two English vessels were sunk but there was significant loss of life. The battle was part of the Hundred Years' War between England and France. 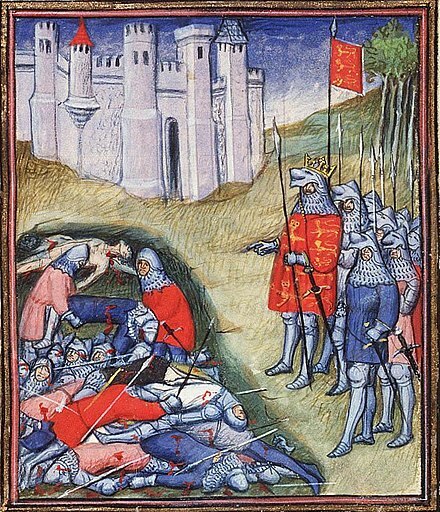 The Battle of Blanchetaque was fought on 24 August 1346 between an English army under King Edward III and a French force commanded by Godemar du Fay. 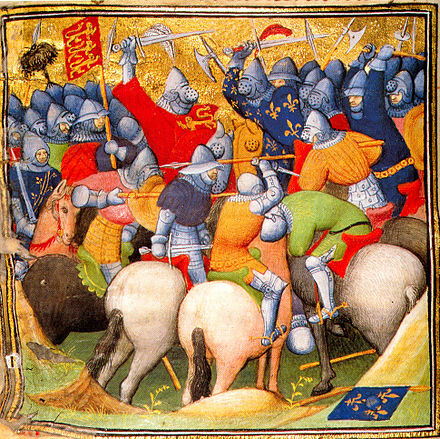 The battle was part of the 1346 chevauchée of Edward III, which took place during the early stages of the Hundred Years' War. The English army had landed in the Cotentin Peninsula on 12 July. It had burnt a path of destruction through some of the richest lands in France to within 20 miles (32 km) of Paris, sacking a number of towns on the way. The English then marched north, hoping to link up with an allied Flemish army which had invaded from Flanders. They were out-manoeuvred by the French King, Philip VI, who garrisoned all of the bridges and fords over the River Somme and followed the English with his own field army. The area had previously been stripped of food stocks by the French and the English were essentially trapped. The Battle of Lunalonge was fought in the summer of 1349 between a French force numbering approximately 1,500 men and an Anglo-Gascon force of some 500 men, during the first phase of the Hundred Years' War. The location of the battle is thought to have been modern Limalonges in Deux-Sèvres. The outnumbered Anglo-Gascons, commanded by Thomas Coke, gained the upper hand during the day, but had to withdraw on foot during the night because the French, under Jean de Lille, had captured their horses. The French lost approximately 300 killed and an unknown but large number captured, including their leader. 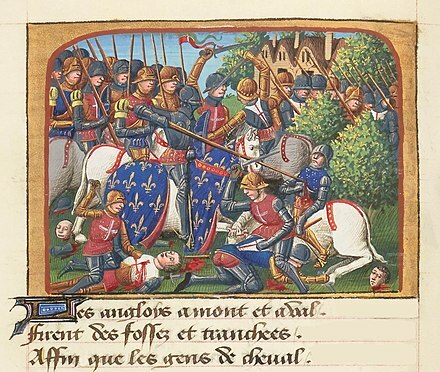 The Battle of Auberoche was fought on 21 October 1345 during the Gascon campaign of 1345 between an Anglo-Gascon force of 1,200 men under Henry, Earl of Derby, and a French army of 7,000 commanded by Louis of Poitiers. It was fought at the village of Auberoche near Périgueux in northern Aquitaine. At the time, Gascony was a territory of the English Crown and the Anglo-Gascon army included a large proportion of native Gascons. The battle resulted in a heavy defeat for the French, who suffered very high casualties, with their leaders killed or captured. The Battle of Caen on 26 July 1346 was the assault on the French-held town by elements of an invading English army under King Edward III as a part of the Hundred Years' War. The English army numbered 12,000–15,000, and part of it, nominally commanded by the Earls of Warwick and Northampton, prematurely attacked the town. Caen was garrisoned by 1,000–1,500 soldiers and an unknown, but large, number of armed townsmen, commanded by Raoul, the Count of Eu, the Grand Constable of France. 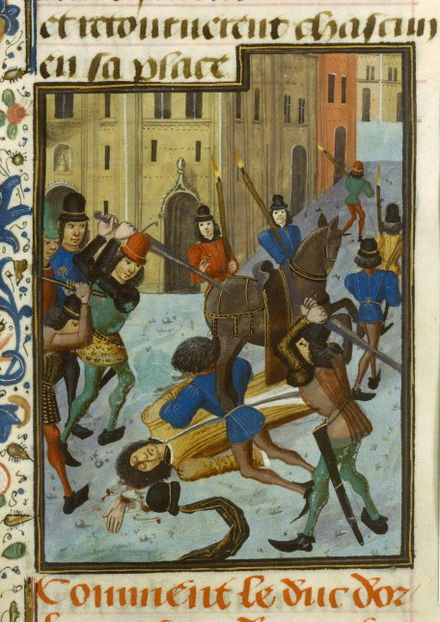 The town was captured in the first assault; 5,000 of the ordinary soldiers and townspeople were killed and a small number of nobles were taken prisoner. The town was then sacked for five days. The dual monarchy of England and France existed during the latter phase of the Hundred Years' War when Charles VII of France and Henry VI of England disputed the succession to the throne of France. It commenced on 21 October 1422 upon the death of King Charles VI of France, who had signed the Treaty of Troyes which gave the French crown to his son-in-law Henry V of England and Henry's heirs. It excluded King Charles's son, the Dauphin Charles, who by right of primogeniture was the heir to the Kingdom of France. Although the Treaty was ratified by the Estates-General of France, the act was a contravention of the French law of succession which decreed that the French crown could not be alienated. Henry VI, son of Henry V, became king of both England and France and was recognized only by the English and Burgundians until 1435 as King Henry II of France. He was crowned King of France on 16 December 1431. The Battle of Bergerac was fought between Anglo-Gascon and French forces at the town of Bergerac in Gascony, in August 1345 during the Hundred Years' War. In early 1345 Edward III of England decided to launch a major attack on the French from the north, while sending smaller forces to Brittany and Gascony, the latter being both economically important to the English war effort and the proximate cause of the war. The French focused on the threat to northern France, leaving comparatively small forces in the south west. The Battle of Calais in 1349 was an incident during the Hundred Years' War when a French army under Geoffrey de Charny attempted to bribe Amerigo of Pavia, an officer of the garrison of English-occupied Calais, to open a gate for them, in the early morning of either 31 December 1349 or 2 January 1350. The English had been forewarned by Amerigo, and their king, Edward III, personally led his household knights and the Calais garrison in a surprise counterattack. The French were routed by this smaller force, with significant losses and all of their leaders captured. Between August and November 1345 Henry, Earl of Derby, conducted the energetic Gascon campaign of 1345 in Gascony, an English-controlled territory in south west France. The campaign was part of the Hundred Years' War, and Derby, commanding an Anglo-Gascon force, oversaw the first successful land campaign of the war. 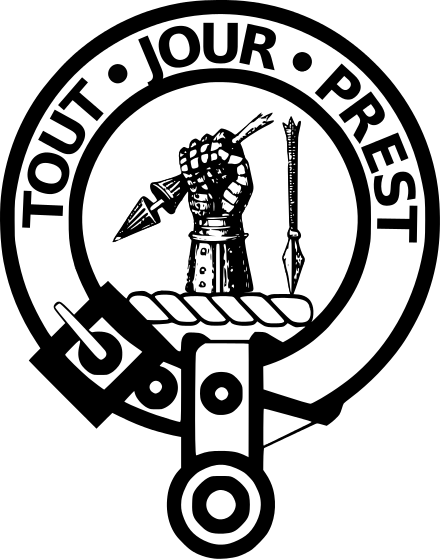 He twice defeated large French armies in battle, taking many noble and knightly prisoners. They were ransomed by their captors, greatly enriching Derby and his soldiers in the process. Following this campaign, morale and prestige swung England's way in the border region between English-occupied Gascony and French-ruled territory, providing an influx of taxes and recruits for the English armies. As a result, France's ability to raise tax money and troops from the region was much reduced. 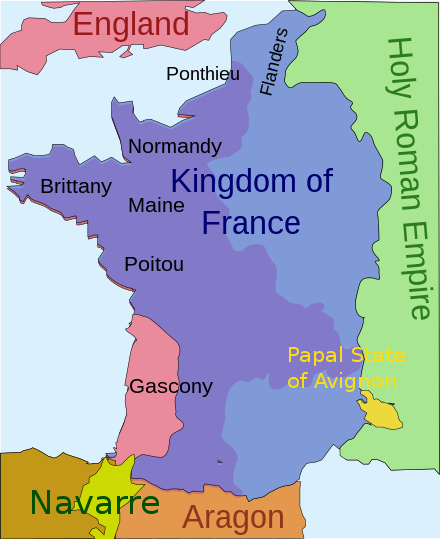 The Gascon campaign of 1294 to 1303 was a military conflict between English and French forces over the Duchy of Aquitaine, including the Duchy of Gascony. 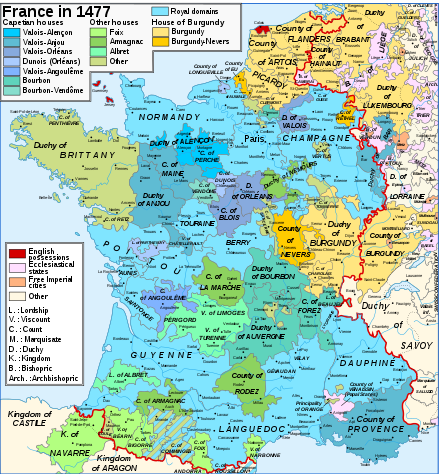 The Duchy of Aquitaine was held in fief by King Edward I of England as a vassal of King Philip IV of France. Starting with a fishing fleet dispute and then naval warfare, the conflict escalated to open warfare between the two countries. In spite of a French military victory on the ground, the war ended when the Treaty of Paris was signed in 1303, which restored the status quo. The war was a premise to future tensions between the two nations culminating in the Hundred Years' War. 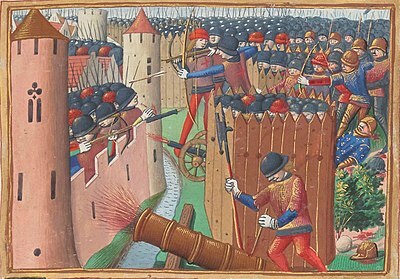 The Siege of Aiguillon, an episode in the Hundred Years' War, began on 1 April 1346 when a French army commanded by John, Duke of Normandy, laid siege to the Gascon town of Aiguillon. The town was defended by an Anglo-Gascon army under Ralph, Earl of Stafford. 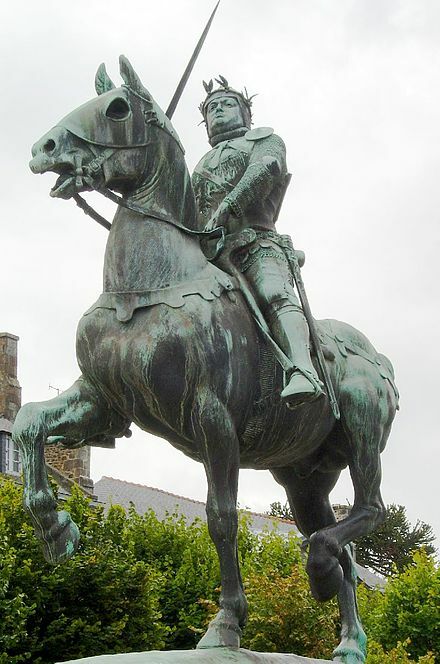 Lancaster's chevauchée of 1346 is the name given to a series of offensives directed by Henry, Earl of Lancaster, in south western France during autumn 1346, as a part of the Hundred Years' War. The Chevauchée of Edward III of 1346, sometimes called the Crécy Campaign, which began on 12 July 1346, with the landing of English troops in Normandy and ended with the beginning of the siege of Calais on 4 September 1346. This expedition devastated a large part of Normandy, Vexin, Beauvaisis, Vimeu, Ponthieu, Boulonnais and the Boulogne. The chevauchée was a decisive victory for England, with the flower of French nobility decimated during the Battle of Crécy on 26 August 1346. The capture of Calais allowed the English to secure a strong and powerful base in the north of France, close to England. Allmand, C. (2010-09-23). "Henry V (1386–1422)". Oxford Dictionary of National Biography (online). Oxford University Press. doi:10.1093/ref:odnb/12952. Archived from the original on 2018-08-10. Bartlett, R. (2000). J.M. Roberts, ed. England under the Norman and Angevin Kings 1075–1225. New Oxford History of England. London: OUP. ISBN 978-0-19-822741-0. Chisholm, Hugh, ed. (1911). "Brétigny" . Encyclopædia Britannica . 4 (11th ed.). Cambridge University Press. p. 501. Curry, A. (2002-11-13). The Hundred Years' War 1337–1453 (PDF). Essential Histories. 19. Oxford: Osprey Publishing. ISBN 978-1-84176-269-2. Davis, P. (2003-05-29). Besieged: 100 Great Sieges from Jericho to Sarajevo (2nd ed.). Santa Barbara, CA: Oxford University Press. ISBN 978-0-19-521930-2. Friar, Stephen (2004-08-19). The Sutton Companion to Local History (revised ed.). Sparkford: Sutton. ISBN 978-0-7509-2723-9. Griffiths, R.A. (2015-05-28). "Henry VI (1421–1471)". Oxford Dictionary of National Biography (online). Oxford University Press. doi:10.1093/ref:odnb/12953. Archived from the original on 2018-08-10. Janvrin, Isabelle; Rawlinson, Catherine (2016-06-06). The French in London: From William the Conqueror to Charles de Gaulle. Translated by Emily Read. Wilmington Square Books. ISBN 978-1-908524-65-2. Ladurie, E. (1987-02-01). The French Peasantry 1450–1660. Translated by Alan Sheridan. University of California Press. ISBN 978-0-520-05523-0. Lee, Sidney, ed. (1903). "Edward the Black Prince" . Dictionary of National Biography . Index and Epitome. Cambridge University Press. p. 388. Neillands, R. (2001-11-08). The Hundred Years Wa2ndion=revised. London: Routledge. ISBN 978-0-415-26131-9. Nicolle, D. (2012-02-20). The Fall of English France 1449–53 (PDF). Campaign. 241. Illustrated by Graham Turner. Colchester: Osprey Publishing. ISBN 978-1-84908-616-5. Archived (PDF) from the original on 8 August 2013. Ormrod, W. (2008-01-03). "Edward III (1312–1377)". Oxford Dictionary of National Biography (online). Oxford University Press. doi: 10.1093/ref:odnb/8519 . Archived from the original on 2018-07-16. Le Patourel, J. (1984-07-01). Michael Jones, ed. Feudal Empires: Norman and Plantagenet. London: Hambledon Continuum. ISBN 978-0-907628-22-4. Prestwich, M. (2003-03-13). The Three Edwards: War and State in England, 1272–1377 (2nd ed.). London: Routledge. ISBN 978-0-415-30309-5. Prestwich, M. (2007-09-13). J.M. Roberts, ed. 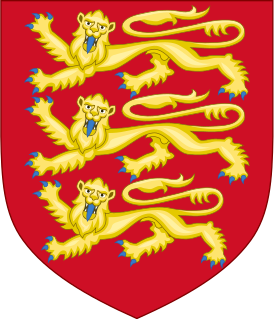 Plantagenet England 1225–1360. OUP. ISBN 978-0-19-922687-0. Rogers, C., ed. (2010-07-15). The Oxford Encyclopedia of Medieval Warfare and Military Technology. 1. Oxford University Press. ISBN 978-0-19-533403-6. Sizer, Michael (2007). "The Calamity of Violence: Reading the Paris Massacres of 1418". Proceedings of the Western Society for French History . 35. ISSN 2573-5012. Sumption, J. (2012-10-04). The Hundred Years War 3: Divided Houses. London: Faber & Faber. ISBN 978-0-571-24012-8. Venette, J. (1953). Richard A. Newall, ed. The Chronicle of Jean de Venette. Translated by Jean Birdsall. Columbia University Press. Wilson, Derek (2011-09-01). The Plantagenets: The Kings That Made Britain. London: Quercus. ISBN 978-0-85738-004-3. Froissart, Jean (1895). Macaulay, George Campbell, ed. The Chronicles of Froissart. Translated by Bourchier, John; Lord Berners. London: Macmillan and Son. Retrieved 24 September 2012. Lambert, Craig L. (2011). "Edward III's siege of Calais: A reappraisal". Journal of Medieval History . 37 (3): 245–256. doi:10.1016/j.jmedhist.2011.05.002. Seward, D. (2003-03-27). The Hundred Years War: The English in France, 1337–1453. Brief Histories (revised ed.). London: Robinson. ISBN 978-1-84119-678-7. Wikisource has the text of the 1911 Encyclopædia Britannica article Hundred Years' War . Wikimedia Commons has media related to Hundred Years' War . "Causes of the Wars of the Roses: An Overview". Luminarium Encyclopedia (Online Resource ed.). 26 Apr 2007. Retrieved 14 September 2017.